Our purpose built ferry boat, the Ptarmigan, sets sail from Morston Quay daily commencing April. 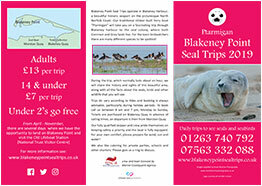 The journey will take you around Blakeney Harbour and out to Blakeney Point to see the inquisitive seals which is now the home of the largest grey seal colony in the UK. You will be able to go up close to spot the ever changing array of sea birds that visit the area. View this unique landscape, designated an Area of Outstanding Natural Beauty and look out for the iconic Lifeboat house, now used as a Visitor Centre for the National Trust. Adults and children alike will enjoy this wonderful experience, no visit to North Norfolk is complete without a seal trip! 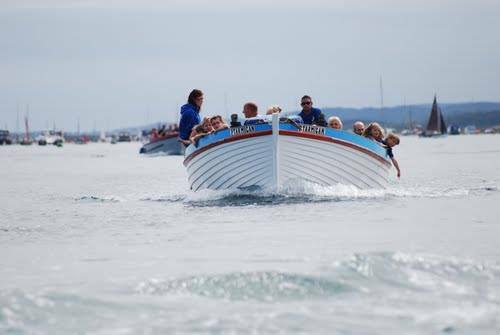 Our traditional clinker-built ferry boat “Ptarmigan” is purpose built and can hold 46 people. As well as sailing daily commencing April, Ptarmigan can be hired for Private Parties, Schools and other Charters. Our fully qualified skipper and his crew pride themselves on keeping safety a priority and the boat is fully fitted with Life-saving equipment. Both our boat and crew are licenced by the Maritime and Coastguard Agency, and fully insured. To book, call us on 01263 740792 or 07563 332088 between 8am – 7pm. For tickets call us on 01263 740792 or 07563 332088 (8am – 7pm). Get your tickets at Blakeney Quay. Depart from Morston Quay.